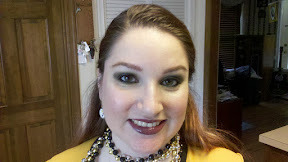 Did a Gold and Black smokey eye for todays game. GO STEELERS!!!!! Apply MAC Lip Conditioner to lips. Apply Tarte ReCreate Prime all over your face and neck. Mix Benefit Foundation with a touch of Tarte Smooth Operator and apply all over face and neck, blend well. Apply Too Faced Shadow Insurance to lids. Shape and fill in eyebrows using Benefit Brow Zings then highligh your brow bone using Benefit High Brow, blend well. Pat on MAC Old Gold Pigment on eyelid and crease. Sweep Urban Decay Honey on crease and a little above crease as well as below the eye. Blend Urban Decay Cobra shadow into crease and outer third of eye lid and sweep along lower lid. You want a smokey eye look. Darken crease and outer third of lid with Urban Decay Black Dog, you want to define without losing the blended color. Line upper and lower lash line as well as inner upper and lower lash line (water line) with Too Faced Lava Gloss. If you wear contacts be careful and don't draw on your contacts like I am prone to doing. Pad Urban Decay Finishing Powder all over face and neck, then gently buff. Buff a small amount of Too Faced Candlelight Powder all over face, neck, and decollete. Sweep Benefit Sugarbomb on cheeks. Apply MAC Faithfully Yours Lipcreme onto lips and dab Stila Golden Charm gloss on top. Smile pretty and you're ready to share with everyone!